5 reasons why we record the yield from our organic gardens. Every year at Camp Full Monte we diligently record the yield from our organic vegetable garden. As the season progresses it is easy to forget what grew well and what didn’t grow so well last year. Some might argue we focus a little too much on yield. For us, it’s served as a good indicator of the overall health and well being of our garden. Sure, there is still a lot of gut feel, intuition that comes into play when you’re gardening organically. We’re no experts and maybe much of what we do is flawed in a wider context but we’ve come to know our own little patch with its own quirks and exceptions to the rules. It’s a constant learning process. Having data to draw on can really help that process. Weigh everything before the cook gets it! But it has to be easy. Especially if, like us, you have a campsite to run or a “day” job. The great thing about measuring yield is it’s pretty easy. 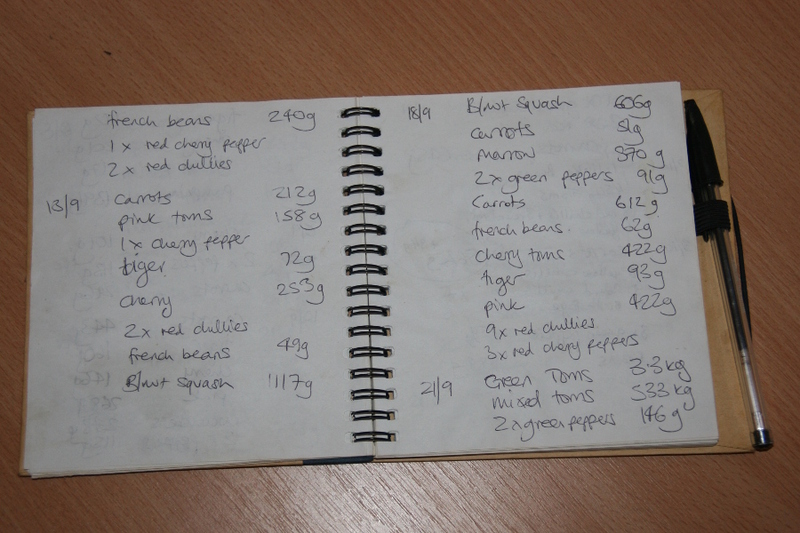 All you need is a set of kitchen scales and a sturdy notebook with a pen, preferably attached to the notebook! Your first stop after leaving the garden is the notebook. Don’t leave it until later. You’ll forget! Date your entry, describe what you picked and how much. Don’t read to much into it right now. You’ve got all winter to look at your data. As long as you’ve learned the lessons by the time the next growing season comes round you’re done and you can pass harvest to the chef! “Really?? ?” I hear you say. I’m not sure I can be arsed. Why does it matter? You sow, you grow you eat, you enjoy. Well here are 5 reasons why we think it’s important. Enjoyable though it is, maintaining an organic vegetable garden takes time and energy. Even the most enthusiastic veg grower will at some point in the year face tasks with diminished enthusiasm. One of our pet hates has to be washing and storing pots. Watering is another. It’s nice to be able to remind your self that those pots nurtured seedlings that went on to yield over 70 kilos of tomatoes. Well worth the effort. 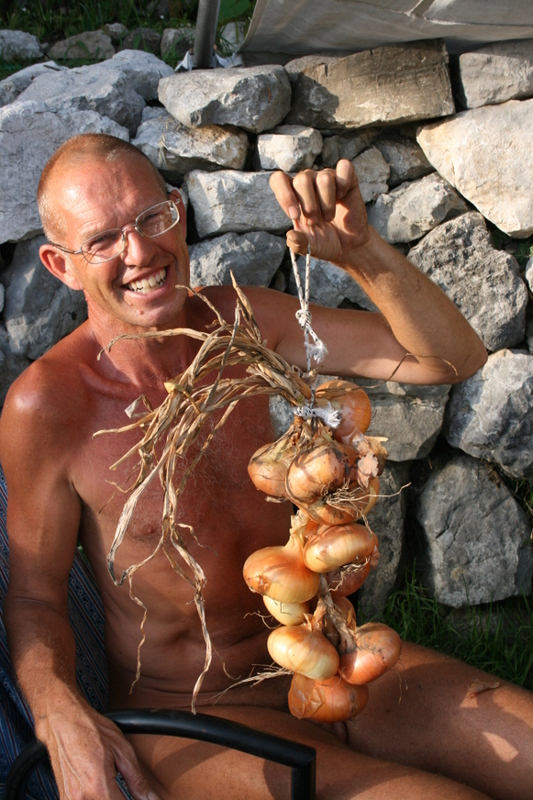 As you stand over your onion rows with a hose it’s nice to think that, based on last year’s results, you’re nurturing a yield that should last until March the following year. A sudden flush of produce from the garden can leave a lasting memory that distorts the truth. It can leave you believing a certain vegetable did well, when in truth, across the whole season it wasn’t so great. The reverse is true for things that crop over a long period of time. If you harvest little and often as the kitchen demands, it’s easy to lose sight of how well the crop performed overall. Yield is a way of putting a number on it. In the dark mid-winter when we gardeners normally have more time on our hands, it is useful to skip through your notes looking for connections between yield and the many factors that can influence it. The weather for example, your feeding and watering approach. You’ll go into next season better informed and with a greater chance of success. 4. Choosing what to plant. When it comes to deciding what to plant, a wide range of influences can drive that decision. Keeping a record of your yield gives you the opportunity to take a fresh look at those decisions. At Camp Full Monte availability and price of veg from local markets is a big driver. Potatoes for example. I’ve never tasted potatoes as flavoursome as those grown & available locally. They’re cheap too. So why bother growing them? They take up a lot of planting space & don’t save you much money. Marrows on the other hand are not so common here. At first we thought that they just weren’t suited to our climate. 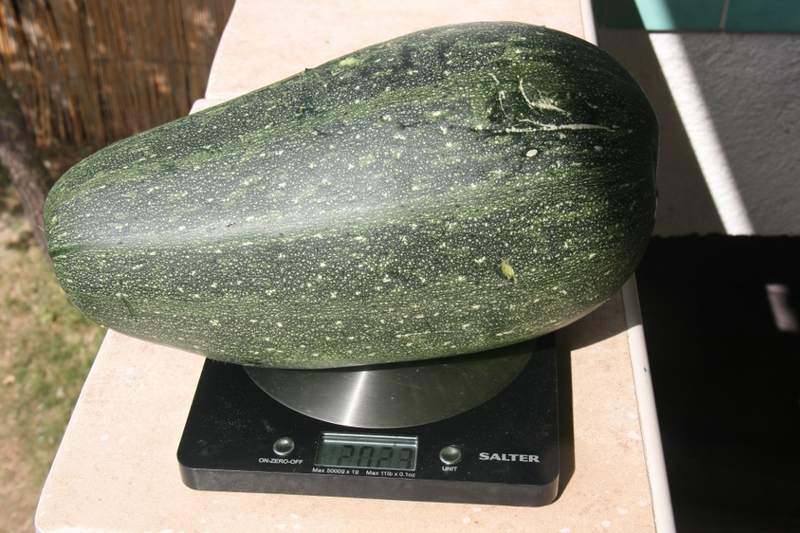 Experimenting with a few seeds from the UK and measuring yield proved they are worth it. Better yet, saving a few seeds for the following year and measuring yield from those seeds has demonstrated that our own seeds do just as well as those originally purchased. Year on year, we try to rotate what we grow in any one spot. Collective gardening wisdom tells us you should try to follow a succession/rotation pattern, Legumes (beans peas etc) followed by root crops (carrots onions etc) followed by fruits (tomatoes, peppers, squashes) followed by leaf (salads herbs). Our yield records have proved that sometimes, despite rotation, our yield has suffered because we’ve kept to this pattern religiously instead of considering other factors like soil type or shade vs full sun. Certain crops will always do well in particular spots. It was not a particularly good year for us. The weather was brutally hot, we had little or no rainfall and we planted much more intensively. Overall our yields were down but there were a few star performers. In our next post we’ll be publishing a summary of our 2017 yield data. We’ll be taking a closer look at what we learned from this data and how it will influence our planting strategy for 2018. In the meantime, please we’d be interested to hear how you measure success in your garden. Add your comments below.